The stocky peasant trudges to the centre of the frame, turns to face the camera and, twinkle firmly in eye, explains why life in his village is like being a fiddler on a roof: “Each of us is trying to scratch out a pleasant, simple tune without falling and breaking his neck.” What has helped them keep their balance for so many years? Tradition is the answer. “I don’t know how it got started,” he admits, “but every one of us knows who he is and what God expects from him.” Then he begins to sing. Norman Jewison’s Fiddler on the Roof centres on that word – tradition – and what it means to the inhabitants of a Jewish village in Ukraine circa 1910. Tevye (Chaim Topol) is a milkman whose chief aim is to settle his five daughters by finding them good (read: wealthy) husbands. The accepted way of doing this is to rely on the local matchmaker who visits each house at regular intervals with tips and suggestions. But unfortunately for the elders, the old ways are changing and the girls have ideas of their own. After the eldest timidly announces that she loves the penurious local tailor, the floodgates open: the next daughter brings a suitor of her own choice too, but doesn’t even ask for her father’s permission, merely his blessing; and most shockingly, the third elopes with a non-Jew, something even the large-hearted Tevye finds hard to countenance. At a wedding a young revolutionary urges men and women to dance together, a first for this village. Meanwhile, cultural upheavals are being supplemented by political stirrings in the outside world: around the country, vast pogroms are underway to drive Jews from their homes. Naturally, he also features in some of its finest songs, including “If I were a Rich Man”, “Sunrise, Sunset” and “To Life”, as well as my personal favourite moments – the recurrent scenes where, on learning of a daughter being in love with an unsuitable man, he half-mutters, half-sings to himself (“Unheard of! Absurd!”), trying to balance practicality with his child’s happiness. What kind of match would that be, with a poor tailor? On the other hand, he's an honest, hard worker. Things could never get worse for him, they could only get better. They gave each other a pledge – unheard of, absurd. They gave each other a pledge – unthinkable. She wants him – and look at my daughter’s eyes, so hopeful. I like the way the camera closes in on Tevye and his private thoughts in each of hese scenes, and follows it up with a shot of the daughter seen from his perspective – she seems to be in the far distance (though in fact, in realist terms, she’s standing quite close to him all along) and the image becomes a visual representation of the vast generational and cultural gap that has opened up between them. 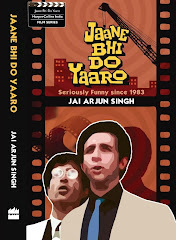 There's a tendency among some Indian viewers who aren’t too familiar with musicals from other countries to label any song-and-dance film as “Hindi movie-ish” or “inspired by Bollywood”, as if we have a patent of some sort on musical tradition. They should be pointed to this three-hour-long film, which has more musical interludes than Hum Aapke Hain Kaun but is firmly rooted in a very Jewish tradition of song and dance. Watching the events it depicts, one can’t help but think that despite (or perhaps because of) the large-scale displacement of Jewish communities in the early years of the 20th century, they continue to exert a strong cultural influence on our lives; their tradition has been among the building blocks of American cinema, theatre and television over the last century. Fiddler on the Roof is a film that operates within that tradition and comments on it at the same time. For all of Tevye’s fears that his way of life was fading, maybe his people had the last laugh after all. Guess, if not for Hollywood, the opinion of Jews would have been lost and they might have lost the very important "sympathy-factor" which plays such a crucial role in policy-decisions taken by governments. Jew-movies are not really jingoistic ones, instead they are poignant. Watching Fiddler will get me labelled as a fuddy-duddy here in America (though not as much as if I were caught watching, say, The Lawrence Welk Show), it is a terrific film. 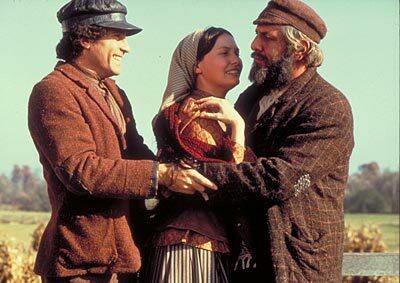 I usually find myself watching Fiddler for two reasons: the ghost/fantasy sequence and the closing sequences. It's pretty amazing that Jewison also made "In the Heat of the night". Pauline Kael was a big fan too :-) The scenes I keep rewinding to is the 'To Life' number. http://www.youtube.com/watch?v=WOTkLh4jW3M. The cossack dance is mind blowing, as is Topol's very uncomplicated singing style. That & the bottle dance during the wedding. In fact it is that rare movie where the songs & dances are both equally good (Cabaret is another one that comes to mind, along with Damn Yankees - both Bob Fosse productions!). The Harnick & Bock team that wrote & did the music collaborated on some other great musicals - Fiorello, She Loves Me are the ones I have heard. Zero Mostel, of the original Producers, did (imho) a better singing job as Tevye in the original Broadway version. Apparently the 2004 Broadway revival with Alfred Molina (Doc Ock) was very good too. where's the shameless self-promotion? where are the modest disclaimers? how long do you think you're going to make it on the promise of naked photographs (not of monkeys)? and in the meanwhile, don't tell me you're going to let *gasp! * your writing speak for itself! on second thoughts, you'd better do a modest disclaimer post. 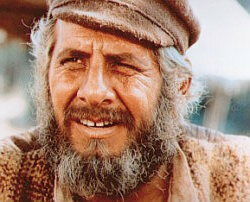 this thread will shortly be flooded with comments that nothing to do with poor tevye. 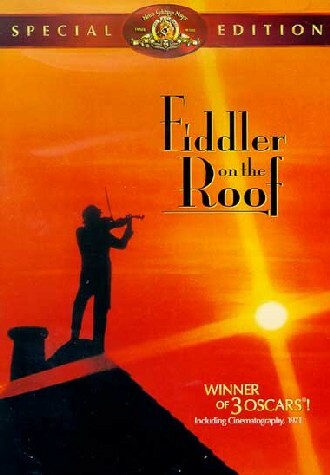 oh i LOVE fiddler on the roof! it's one of my all-time favourite movies, but always felt secretly ashamed of liking it so much. even bought the soundtrack so I could yell, sunriseeeeeeeeeeeee, sunsetttt, swiftly flyyyyyyyy the yearsssssssssss. I have always wanted to watch FOTR and finally caught it on Zee Studio last month. Must say it wouldn't have been the same if Topol weren't playing the lead. He deserved the Oscar nomination for his role. I loved his performance in 'If I were a Rich Man'. The movie followed the musical, which enjoyed great popularity on Broadway and on stages throughout the US. So while the play was made into a movie, it never was designed to be a movie, but a stage play with lots of singing and dancing. That is why there are so many songs. Publia: I know Fiddler on the Roof was originally a play, but I don't understand what you mean by "it never was designed to be a movie, but a stage play with lots of singing and dancing. That is why there are so many songs". Where's the correlation? As I'm sure you know, there are also plenty of musicals that were originally movies. Fiddler's music is perhaps my favourite of any Hollywood musical, even Sound of Music, which like many other Indians of a certain age and station I've seen about sixty times. I suppose it's the schlockiest of all the tunes, but 'Sunrise, Sunset' never fails to move me. I have always wanted to watch FOTR and finally caught it on Zee Studio last month. Must say it wouldn't have been the same if Topol weren't playing the lead. I knew I'd seen that Elijah Wood somewhere around. Are u aware that "fiddler on the roof" is being adopted as a play by Raviraj(IIT/IIM/FTII) and is running in SRC. The Last two shows are on this weekend (15-16th) I would be happy if you come and watch the play "please be my guest" would love to hear your comments on it. P.S. in case you can't get the tickets please let me know my id is "nicks.iitd@gmail.com"
I've seen different musicals many times and Fiddler was one of my best attended shows ever…I got a pretty good seat after comparing prices for Free from Ticketwood.com . It was really one of the most memorable shows with a beautiful, smooth-flowing set, gorgeous music and a super talented cast.